Christmas Eve, 1968: three astronauts recited versus from the Book of Genesis to the people of Earth. 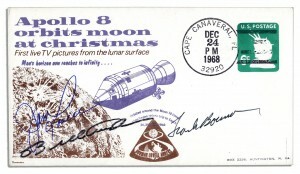 Frank Borman, James Lovell, and William Anders did a live presentation wishing us a Merry Christmas from 200,000 miles away. Although several audio postings have surfaced over the years, I hope you will enjoy this link that embeds pictures and music to the message. Hail, thou redemption of the tears of Eve. Hail thou from whom flows forth milk and honey.